This year Honda surprised its buyers by launching the new Honda Amaze with all new Features, five years after its first gen model that was launched in April, 2013. There is no doubt to the fact that the new Honda Amaze is bigger and better than its earlier model and even far better than its competitors. You will experience a unique SUV-esque in-your-face boxy design, superior interiors, high-end features, the unique diesel-CVT option and a better ownership in a single model. So come and discover what Honda is offering to its customers who are considering buying the new Honda Amaze. Honda Amaze is available in 12 different variants (6 petrol and 6 diesel) and in 5 vibrant colors (including Golden Brown Metallic, Lunar Silver Metallic, Modern Steel Metallic, Radiant Red and White Orchid Pearl) that will surely turn everybody’s heads turn while hitting the road. Honda has launched the new Amaze at INR 5.59 lakhs for the basis petrol variant; however, the top diesel model is more than INR 8.67 lakh. If you have awesome bargain skills, you can get some attractive discounts using automobiles offers at the company’s outlets. The new Honda Amaze comes with bold design, more features, improved ergonomics and the convenience of an automatic CVT gearbox in both the petrol as well as diesel models. As compared to the previous model, the new Amaze has a premium cabin with improved NVH levels and improved ride quality. The company has made some significant changes in the new Honda Amaze 2018 to make it more versatile and attractive. While the engine line-up remains unchanged, the subcompact sedan has undergone a change this time. Size: The next-generation model of this compact sedan is approximately 3900 mm in length; the width and height is 1680 mm and 1505 mm respectively. 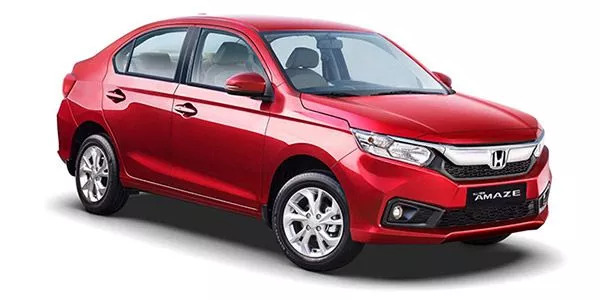 Safety Features: As per the latest guidelines by the government, this compact sedan car has dual airbags and ABS with EBD as standard across the range. It also include ABS (Anti-Lock Braking System), EBD (Electronic Brake Force Distribution), cruise control, reverse parking camera and reverse parking sensors. Some other prominent features include paddle shifters (petrol only) with CVT transmission, 7-inch infotainment system with Apple CarPlay and Android Auto, cruise control function, rear parking camera support and passive keyless entry with push-button engine start-stop. Exteriors: The new-gen Honda Amaze comes with a significant design change; the blackened head lamp units have also been tweaked looking larger with widen bonnet. Also the increased boot space features a thick chrome band running across the width of boot lid which should certainly suit the Indian buyers taste. This time, the company made some changes like the LED daytime running lights and the upsized the aluminum alloy wheels. Interior: The all new Amaze is designed to give utmost comfort to its customers; the contours on the front seat will surely make your drive more comfortable and relaxing. Even the rear seats features an easy and relaxed seating posture with a cushioned armrest; just stretch your legs and enjoy the luxury on the wheels. The new and improved overall interior space with increased storage spaces, including 1-litre bottle holders on all doors will surely attract its buyers for the test drive. Also the push button start, keyless entry and LED turn indicators on wing mirrors have enhanced the look of the car significantly. Engine: The new Amaze is featured by the existing set of proven powertrains – the 1.2-litre i-VTEC petrol and the 1.5-litre i-DTEC diesel engine. The petrol model comes with a five-speed manual and a CVT gearbox, similarly the diesel model gets a manual option and a CVT option as well. When paired with the CVT gearbox, the diesel engine offers a relatively lower power figure which stands at 79bhp at 3,600rpm and 160Nm of torque at 1,750rpm. The company has worked harder to make the engine less noisy and improved the sound deadening as well. Other: The new Honda Amaze comes with a 7” touchscreen infotainment system, a new instrument cluster with MID, paddle shifters for petrol CVT model, automatic climate control, cruise control, engine start/stop button, power folding and adjustable ORVMs with integrated turn indicators and shark fin antenna. Also the advanced floating DIGIPAD 2.0 has a series of advanced functionality such as navigation, access to social networks, messaging, music and much more. Just connect your drive with your smartphone enabled digital lifestyle through intuitive and easy-to-use controls. You can also connect your Android phones with Android Auto and keep listening to your favorite songs while driving on the roads. Honda’s engines are well known for their good fuel-efficiency and mileage. The average mileage of the new Honda Amaze petrol is 19 kmpl and for the Honda Amaze diesel it is 27 kmpl. This is for sure that the all new Honda Amaze is going to give a tough competition to its subcompact competitors including Maruti Suzuki Dzire, Ford Aspire, Volkswagen Ameo and the Xcent from Hyundai and is far better than its earlier model. The new Amaze is fully equipped with all the latest features and if you are looking to buy a compact sedan with sports look then do consider its CVT Diesel model. So book the test drive of Honda Amaze today and get amazing automobiles offers by the company on its latest Amaze models. Visit your nearest Honda Amaze showroom for best offers; you never know what the company has in store for you.